Located in the newest development of McAllen Texas. Nearby major corporations include McAllen industrial commercial and residential areas. The Homewood Suites by Hilton McAllen is either within walking distance or a short drive from a variety of restaurants just minutes away from local shopping and La Plaza Mall. US and Reynosa Mexico International Border are approximately 10 miles away from the hotel. 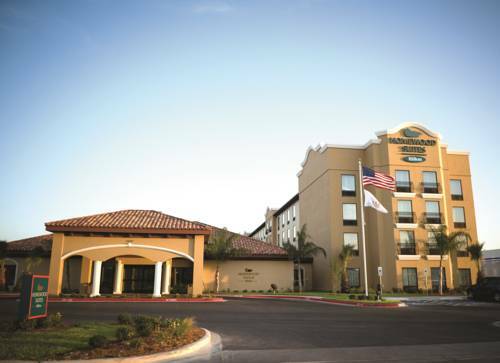 The New McAllen Convention Center is adjacent to the Homewood Suites by Hilton McAllen. The property features 114 studio or one and two bedroom suites /separate living and sleeping areas/. All suites have a fully-equipped kitchen full-size refrigerator microwave oven coffee maker two phones with data ports and wireless High Speed Internet Access. Iron and ironing board and hair dryer are standard in all our suites. The hotel has a Business Center that is complimentary to guests and accessible 24 hours a day. Enjoy our daily complimentary Suite Start hot breakfast a Welcome Home Reception Monday through Thursday evenings complimentary local calls on-site laundry facilities and complimentary grocery shopping services as well as snacks and sundries available in our 24 hour Suite Shop. Tony Romas Ribs: American food ribs hamburgers steaks and salads. BJ*s Sports Bar: Casual fare large screen TVs with current sporting events televised nightly.